Against a backdrop of increasing pressures and criticism of the game itself, 1st and Forever takes a stand to contend that football is vital by showcasing the inner character of those who’ve played the game. From European refugees who carved out their legacies between yard markers, to life-changing humanitarians inspired by their on-field experiences, to Hall of Fame players whose positive influence has extended far beyond the close of their careers, 1st and Forever stitches a tale of lives bettered, defined, and enriched by a sport that is like no other. As a long-time coach and former president of the National Football Foundation, Bob Casciola has served the game he loves for decades. In 1st and Forever, he takes that service to a new level by laying out his case for why, and how, football must be saved. Through a series of inspiring tales of his own experiences and interactions with many of those—both big names and not—with whom he’s crossed paths, Bob makes a case that the future for football can be as bright as its past. 1st and Forever illuminates that the experience of the game itself is too positive and beneficial to cast aside—especially for today’s youth, who deserve the same opportunity to shine on the field as well as off it. "Football is all American. It always has been and always will be. Yet, nobody has their heads in the sand, starting with Bob Casciola. His lessons learned on all levels provide a gateway to lessons to be learned in the future on all levels. 1st and Forever is both a feel good and feel enlightened read for football fans present and future." "The current concussion crisis that is plaguing football is a concern by all who love and appreciate the game. Concerned that the issue could prevent many young people from benefiting from the gridiron experience, Bob Casciola, one of football's greatest ambassadors, who played and served as a coach and an administrator, has skillfully penned for us 1st and Forever, answering the question as to why football must be preserved. Thanks Bob!! This needed to be done." 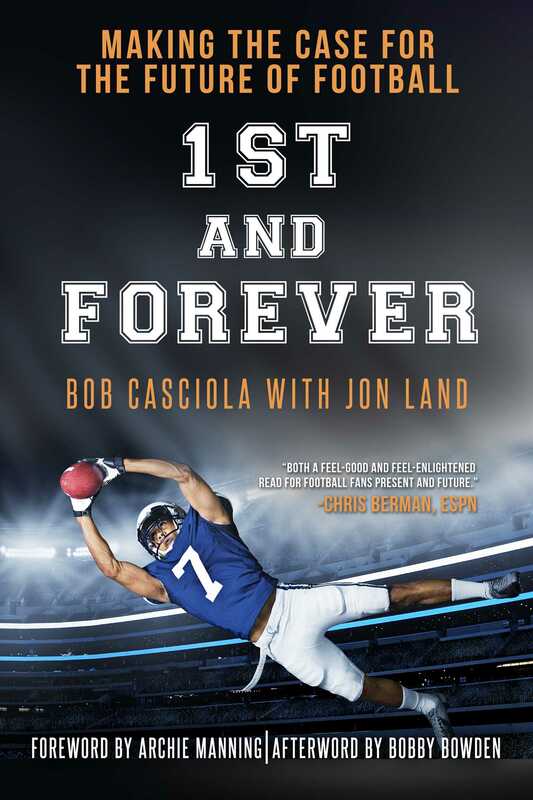 "The deep-rooted affection that Bob Casciola has for the game of football resonates through the pages of 1st and Forever. He reveals the inner satisfaction an individual can achieve while playing a sport as well as the gratification of being a part of a team that needs all performers acting in concert to accomplish success. . . . This book is not about blocking and tackling, it's about developing character and how a young man can grow and be a viable contributor to our society. All parents who have a son should read this book. Your understanding of the game of football and what it can do for young people will give you insights worthy of a deeper dialogue with your family." "Bob Casciola's words resonate in these pages as football is under siege in this country. Great men have played this game, and if we're not careful an entire generation of greatness may never see the gridiron. Understanding how to protect the game, but also grow the game is critical and his genuine approach here is heartwarming and effective." "Football could have no more authentic voice than Bob Casciola. 'Coach Cas' has devoted his life to the game he loves. Now he has written a timely and important book on why football is so central to our culture. This is an important read for those engaged in the defense of America's favorite sport." "1st and Forever is just what the doctor ordered for football. A story about winners both on the field and off, this book can make anyone fall in love with the game and make diehards love it even more. Like me, Bob Casciola has spent a lifetime around the gridiron and no one is more qualified to paint a picture that casts football in the proper light to counter the shadows that have fallen across the hash marks. Sterling in its approach, convincing in its arguments, and timely in its message, 1st and Forever etches a portrait of a game that has its best days still ahead of it." "Football teaches those involved life skills, the importance of hard work and provides opportunities for the future. It unites people, teams, families, and towns. Football fans all come together from different walks of life to cheer for their team and a common purpose bigger than themselves. 1st and Forever is about the game of football and its importance to America." "Coach, teacher, promoter and defender of the game of college football, Bob Casciola has a seasoned and wizened view of the game with which he has had a lifetime affiliation. He loves football and has seen countless kids benefit from the college game. He has a salient message that puts in measured perspective, why we should all redouble our efforts to preserve and protect the game we love. Listen up." "Bob Casciola and Jon Land have done an exceptional job of portraying the many contributions that the game of football has made and will continue to make for the athletes who participate in the game. Bob's many experiences, insights and profound successes throughout his career should bring encouragement and excitement to one and all who question the value and success of the sport at an individual level. This book is not only a tribute to a great sport, but to all those whose lives have been touched by their own experiences. 1st and Forever is a truly great read about football at its best." "Bob Casciola has captured football at its very core, what always has and continues to make this the most popular sport in America. I played the game, my brother played the game, and now both my sons play the game. So, I've gotten to see the game through their eyes as well and I'm seeing the same thing, the same benefits and positive experiences that I saw through my own. And, in that respect, what amazes me the most about football is, the strategy of the game changes, the pace of the game changes, the X's and O's of the game changes, but the experiences of football never changes. What my sons are getting from the game is the same thing I got from it and, more than anything else, 1st and Forever wondrously captures that spirit." "If football requires extraordinary levels of perseverance, toughness and determination — and anyone who has followed it for any amount of time would agree that it does — then 1st and Forever has captured the essence of football. 1st and Forever tells stories of true grit as it reveals lessons learned by the men in the chapters, but it doesn't stop there. The value comes through as the players and coaches went on to impact players for the rest of their lives, always drawing on the virtues gained on the field." "An awesome read! 5 stars, because that's the highest allowed... You don't need to be a diehard football fan to love 1st and Forever." "A very interesting and compelling nonfiction read that any fan of football who is also concerned about the future of the sport will want to check out and add to his/her reading list... Bob Casciola and Jon Land have written an absolute gem of a book with 1st and Forever, detailing through chapters about Hall of Fame football players and coaches the case for why football is a sport that deserves to be preserved and to continue being a positive influence on the lives of those who play the game, are coaches, or who are fans of football."